The marine Homonculus hypothesis is an individual development of the theory of initial bipedalism, regarding the origins and evolution of mankind. Other authors, like Max WESTENHÖFER, Serge FRECHKOP, Klaas de SNOO and Bernard HEUVELMANS, have on several occasions expressed their dissent from the current view of what might be called the "simian ancestry of our humanity". 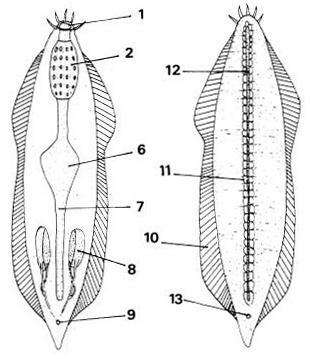 Studies on human anatomy and physiology ( WESTENHÖFER 1948, de SARRE 1988 ) have indicated that man preserved structural primitiveness and surviving features from a former aquatic life [ in comparison with the other amniotic land-dwelling vertebrates ], so that he could directly be connected with archaic pre-human water forms. Humanity did not develop from some branch of the ape-stock that entered the sea, then the land again, as Sir Alister HARDY ( 1960 ) emphasized. The genus Homo originated from an ancient stock peculiar to himself. Thanks to the primitive charasteristic of his big brain, man could have remained a biped. Indeed, in their initial stages of embyrological development, the quadrupedal vertebrates display a brain organization superior ( i.e., ’human-like’ ) to that which is achieved with complete growth ( WESTENHÖFER 1953 ) : the problem of human origins can be carried back to a very early stage in the evolution of the vertebrate line ! that has given birth to the human lineage. Ventral sight ( on the left ) and dorsal sight ( on the right ). the protochorda, the neural duct and the alimentary canal. Returning to modern man, we shall notice that, from an embryological standpoint, the brain comes before the skull, and not the opposite. The volume and weight of our encephalon determine the degree of flexion of the skull-base. 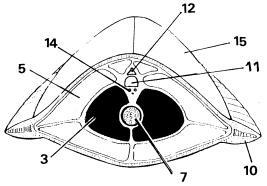 The growing chorda dorsalis moves under the osseous skull base and "locks" the whole body in an upright position which is still the original embryo disposition. The globular form of our human brain is a primitive feature, as WESTENHÖFER 1953 and HEUVELMANS 1954 emphasized. From a mechanical point of view, it was in water, i.e. during a former aquatic stage - and at this moment only - that the today shape of our brain developed and - subsequently - the globular form of our bony brain-pan ! The phylogeny of the water-dwelling pre-Hominid [ until the archepagoge-stage, i.e. with 4 limbs and a round head ] is summarized in Fig. 3 .
through the dwelling-up of a sustenance organ in a marine creature. Man’s large and globular brain represents the final evolution of a marine animalcule’s floating and sustenance organ. 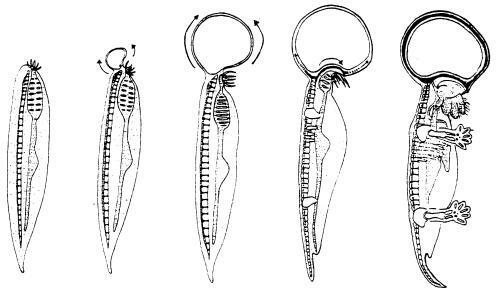 Embryologically, the outer skin ( epidermis ) developed from ectodermal cells, during the gastrula stadium, and the brain formed in the same way, in the course of ontological development. Our osseous skull, in compensation, originated from the same mesodermal cells that are also building the embryonic vertebral column and musculature. In the course of the phylogenetical history of the Marine Homonculus, we may suppose that a floating organ developed on the top of the body, as a "bubble", like in a medusa. Between an inner ectodermal bag, filled with gas, and the outer skin, a mesodermal membrane would extend [ whose cells originated from the spinal cord ]. It was this which once shaped the original form and structure of the vertebrate skull ! Such a round figuration, like the human head, only could develop naturally in water. The Marine Homonculus then started to evolve into the first land-living Vertebrates. This was, in remote times, the completion of the human form and the conception of an original bauplan of bipedal placentary mammals. HARDY, Alister (1960) : Was man more aquatic in the past ? The New Scientist, 7 : 642-645. HEUVELMANS, Bernard (1954) : L’Homme doit-il être considéré comme le moins spécialisé des Mammifères ? Sciences et Avenir n° 84 : 132-136, 139. SARRE de, François (1988) : Initial Bipedalism : an inquiry into Zoological Evidence. WESTENHÖFER, Max (1948) : Die Grundlagen meiner Theorie zum Eigenweg des Menschen. Carl Winter Univ.- Verlag, Heidelberg. condensé et annoté par Serge FRECHKOP.